Coffee is very low in calories, but provides energy due to its caffeine content. While this can be beneficial from a dieting standpoint, coffee prepared with milk and sugar can be high in calories, depending on how much and what type you use. Coffee with milk and sugar can be enjoyed by most people without negative consequences if you are aware of the health facts. Even with added milk and sugar, coffee -- which naturally provides 2 calories per 6-oz. serving -- can be low in calories. If you add 1/4 cup of skim milk and 1 tsp. 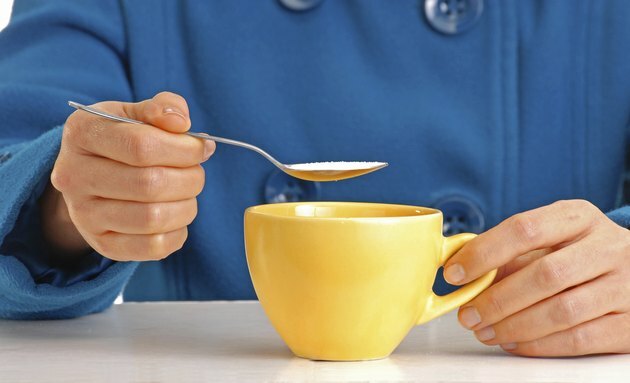 of sugar to your coffee, the drink will provide 42 calories. This amount is less than half the calories found in an 8-oz. serving of soda, which provides 100 calories. Sugar is more calorie-dense than milk, so if you are watching your calorie intake, keep a close eye on how much sugar you use for flavoring. Carbohydrates are the main nutrients in skim milk and sugar, so they can add a significant number of carbohydrates to your coffee. Using 1/4 cup of skim milk and 1 tsp. of sugar will provide a total of 8 g of carbohydrates, with all 8 g coming from sugar, and no fiber. Although carbohydrates are beneficial because they provide energy, the Harvard Medical School notes that high sugar intake -- particularly in the form of sugar-rich beverages -- may encourage obesity, as sugar tends not to be filling. Skim milk is rich in protein, although if you only use a small amount in your coffee, the contribution will likely be insignificant in the scope of your daily diet. Because coffee contains very little protein and sugar contains none, a 6-oz. cup of coffee with 1 tsp. of sugar and 1/4 cup of skim milk would provide 2.2 g of protein. Protein helps build muscle and other body tissues. Coffee and sugar do not contain dietary fat, although all varieties of milk other than skim do provide fat. If you use 1/4 cup of whole milk, your coffee will contain 2 g of fat, while using 1/4 cup of 2 percent milk will add 1.25 g of fat to your coffee. The caffeine content of coffee varies widely. Neither milk nor sugar provide any caffeine, so these ingredients do not alter the overall caffeine content of the beverage. MayoClinic.com notes that the caffeine content of a typical 8-oz. cup of instant coffee ranges from 27 mg to 173 mg. Brewed coffee caffeine content ranges from 95 to 200 mg per 8-oz. serving.